Save 20% on food/beverage tickets during our special pre-sale promotion at Sheboygan area Kwik Trip stores. Discounted tickets are for sale July 1-31, 2018. Yes, we are still accepting past years Brat Days tickets! 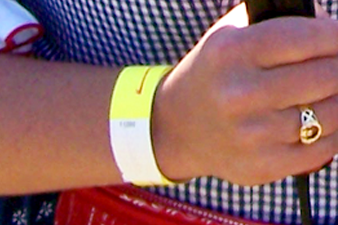 Tickets are used to purchase food and beverages on the grounds. Please note that Brat Days tickets will not be accepted for the Carnival mechanical rides. Carnival ride tickets can only be purchased in the carnival ride area. We've got the best... Johnsonville's Ultimate Natural Casing Original Brat! Sheboygan is the "Home of the Brat"
Want to tickle your taste buds this summer? While you might think that brats only come as a "single" or a "double" on a hard roll with condiments, you're wrong! When you venture to Sheboygan this summer, prepare to make some major "sausage consuming" decisions! In what has become lovingly referred to as "Brat-Tastic", you will find many tantalizing and out-of-the-ordinary creations. ► Everyone 21+ must show ID to receive a FREE wristband to be able to consume our delicious malt beverages. We’ve added some new choices to our selection that you are sure to enjoy! Note: Offerings and prices are subject to change.